Ah, peaches. Forget the yellow-orange wedges that slide out of a can. Forget everything you know about peaches from a grocery store. 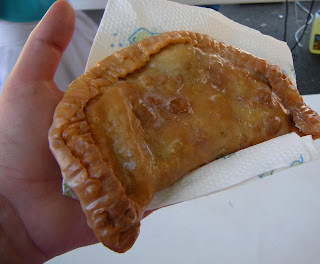 Just think about the blistering heat of summer, the shade of a large tree, the tang of that first slightly-fuzzy bite, the syrupy sweetness of an over-ripe fruit, the way the juice rolls down your chin no matter how neat you are. 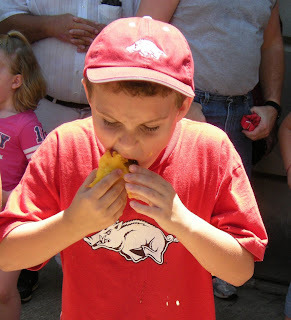 Peaches are the first true taste of summer in Arkansas. That's one of the many reasons I hit the road with my traveling companion and headed up to Clarksville for the Johnson County Peach Festival. The state's oldest outdoor festival was certainly worth a look-see. And like many of the great festivals across Arkansas throughout the summer, we found people from around a community, coming together for a good time. But there was something missing this year. It was a Friday morning, closing in on noon. We'd arrived a little too late for some of the more amusing entertainments, such as the greased pig race and the frog jumping contest. The terrapin derby had just wrapped up, and folks were starting to find their way over to the food vendors. Hawg Trough BBQ had their catering rig set up, and a couple of churches had booths selling burgers and sweets. 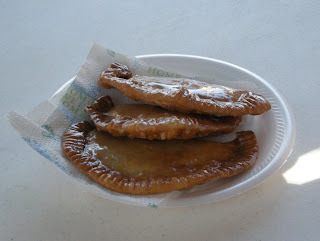 There was kettle corn and funnel cake and fresh-squeezed lemonade (with and without sugar), corn dogs on a stick and fried Oreos and all those lovely festival foods we wouldn't be caught dead consuming indoors or outside of festival time. 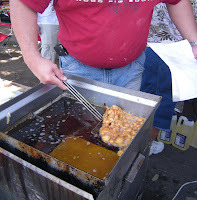 The aroma hanging over the relaxed crowd was one of satisfaction and deep fryer grease. Vendors from around these parts had set up in carefully aligned rows on the Court Square, some hawking T-shirts and purses and jewelry, others with quilts and potholders and rag dolls, still others just handing out pamphlets and water bottles and information. Kids were playing hard in the kids area, where giant inflatable slides and castles loomed over a lone ticket seller taking money for the right to take off your shoes and go bounce in a bouncy castle. We checked the schedule, noticed a gap, and decided to explore a bit around the nearby area. Right across the road from the courthouse grounds was Teeters Pharmacy -- at least, that's what it said on the marquee outside. We crossed the road to investigate, and discovered that a curio shop had invaded... but not entirely. Nestled among the wide range of antiques and whatnots, we found a pharmacy counter (complete with pharmacist and assistant! ), a candy counter, a dish registry, and lots of neat little knick-knacks. With stomachs rumbling (and my never-ending search for good food continuing) we walked down a bit to see what else we could find. We passed a shoe store, an antiques market, and turned down next to Fred's. No food to be seen. muscadine trellises overhead, a little oasis. Sadly, strange signs greeted us, and we discovered we were looking at a defunct business -- that, for the humble price of $50,000, could be yours to "rock" the area. Well, looked like it was definately fair fare for us for lunch. No problem. We wandered back over to one of the stands operated by one of the church groups. I always like this sort of stand -- the food tends to be cheaper and somehow enhanced by the humbleness of its nature. 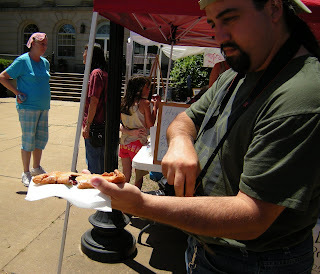 Fried pies were being turned out of a deep fryer, and we couldn't resist ordering up a pair of blackberry. 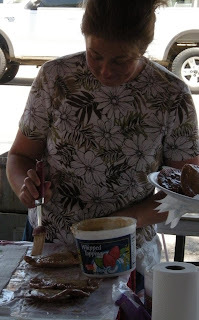 The lady working the pies flicked a brush into a Cool Whip container, coated the pastries with something that was somewhat but not completely unlike Cool Whip, and we were handed very hot morsels of delight. 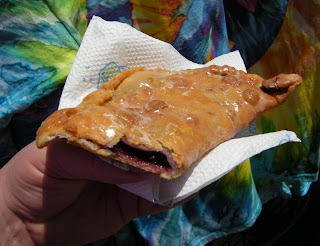 You just know when you're getting something homemade -- outside of the obvious crimping and icing of such pastries, there's that taste... that wild blackberry taste you can't replicate with pie filling. Someone, maybe this year or the last, had hand-picked those blackberries, maybe on the side of the road or out on someone's farmland, but those berries had been obtained with scratches and bug bites and a lot of love. The pies... were excellent. But yet, there was still something missing. We went over to the gazebo for a seat and a chance to consume our pies. I watched one of the booths nearby for a while, where hair garlands and yarn puppets were being sold. Little girls clamored for the wreaths of artificial daisies. 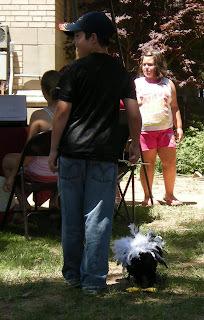 I saw a young man "walk" a black chicken puppet across the lawn with a great deal of skill. Another customer bought a little pink poodle puppet -- which was apparently lifelike enough to draw the attention of a nearby woman and her fine example of a miniature schnauzer. After our soujourn in the shade, we went back out for more. 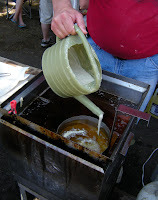 and peered in on the making of funnel cakes. But still, something was missing... something essential. Our curiosity piqued, we entered the courthouse to find out what was really going on here. And that's where we discovered the sad truth -- this Peach Festival, sadly enough, had no peaches. More than a month's worth of rain (six or seven inches' worth in some places) had delayed the crops. Peaches were still green on the trees, and it's likely to be the second week of July before the majority of this year's crop are ready. Wow... a Peach Festival without peaches. Yet no one's enthusiasm had seemed to flag. There were still all sorts of things going on for everyone to do. I suppose it had turned into more of a celebration of the peach than anything else. 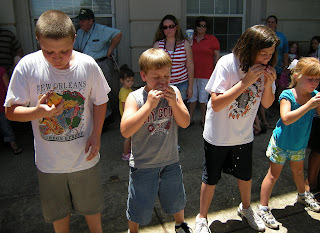 One o'clock was approaching, and we ventured out to the courthouse steps, where children of all ages were gathering. And that's where we actually saw our first peach -- a half-bin-full provided by Holben's Triple D Farms, a local operation that had sent over its first ripe fruit of the season. Yay, there would be a peach eating competition after all. The kids were sorted into an older (8-12) and younger (under 8) age group. 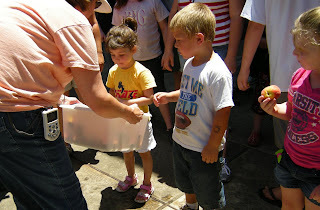 They each signed up for the contest and took a peach offered to them. 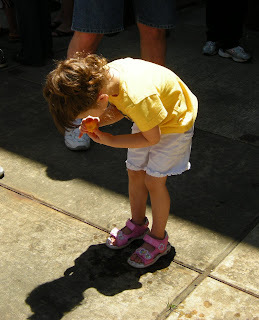 The rules were explained -- each competitor was to eat the peach all the way down to the pit, then hold it up. They were told that these were cling peaches, so don't be surprised if some of the yellow stubbornly held onto the pit. Heads were counted, roll was called, and then they were off! The splat of juice at the feet of competitors was barely audible over the cheers and encouragement of parents in the crowd. In under a minute, several of the kids had held up their pits in glory. The next heat was organized, with the younger kids. As the rules were being explained, a couple of the kids misunderstood and started eating when "ready set eat" was mentioned -- and then they were all into it. 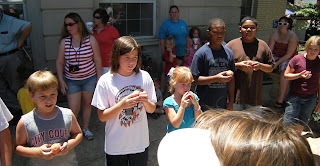 The younger kids seemed to go after the peaches with even more zeal... and even when the winners of the heat were declared, most of the kids continued to eat, enjoying and savoring their peaches with vigor. 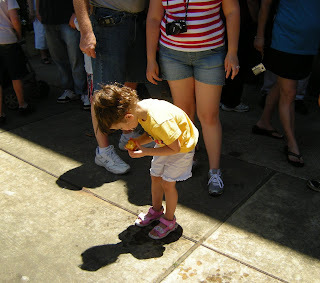 One young lady was oblivious to the crowd and ate every bit of her peach, bent over to keep the juice from rolling down the front of her shirt. The third heat began, and... well, see for yourself. It was, indeed, a sight to behold. Afterwards, we went inside the cool courthouse to await the beginning of the food competitions -- jams, jellies, and cobblers. It took some time before we saw the first of the cobblers laid out on a table, and we waited with anticipation for more. And we waited. And waited. 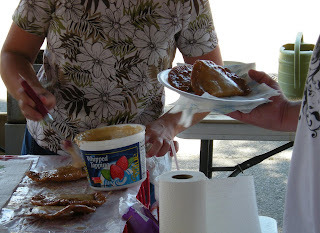 And then we finally realized -- the single cobbler and single jar of jelly was all there was for the competition. The rules clearly state that the peaches used in the recipes have to come from Johnson County... and perhsps that's why there were so few entries. 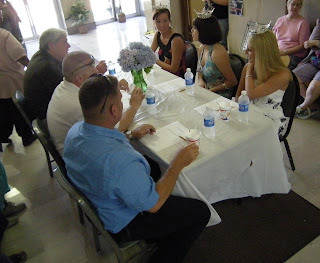 The crowd that had formed around the judges table watched as the judges were interviewed -- Jennifer Breedlove, Queen Elberta 2008; Arissa Griffin, Miss Arkansas Valley 2008; and Miss Arkansas 2008, Ashlin Baston -- who told a reporter that she had better have some peach cobbler! When he mentioned that there was just one cobbler and that three of the judges were big burly law enforcement officers, she told him "I made it through 47 other girls at the Miss Arkansas Pageant; they have something to worry about." 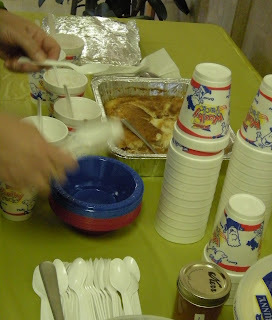 The cobbler samples were passed around, notes were taken, the winner announced. Hopes for more peaches were shared all around. And this is where we left off, heading out the doors and back home. 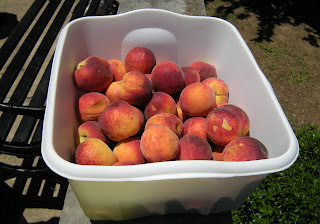 Another trip out west on I-40 is planned soon, as soon as we hear that peaches are ruddy orange and ready for picking, and we can savor that fruity delight on our own. 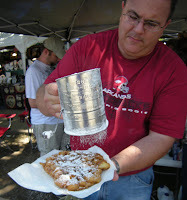 This was the 67th festival... and Arkansas' oldest outdoor festival gathering. I bet it will continue, peaches or not. Most years, the rain and the weather are agreeable to synching up on having the peaches ready. So they weren't this year? That's AOK. If you'd like to learn more about the festival, peaches, or whatnot, contact the festival organizers.